The SCO (Shanghai Cooperation Organization) Youth Council foundation conference was held on 2-5 May in Yekaterinburg. As reported by the Information Policy Department of the Governnent of Sverdlovskaya region, the members of the brand-new organization turned out to be largely Muslim youth, to be more precise representatives of national youth organizations of the SCO member states such as the Youth Congress of Kazakhstan, the Youth Wing “Zhas Otan” of the People's Democratic Party “Nur Otan”, the Youth Public Council of Kyrgyzstan, the Youth Union of Tajikistan, the All-China Youth Federation as well as the Russian Youth Association and the Youth Public Chamber of Russia. Besides that representatives of the SCO observer countries, governmental and legislative authorities of Russia also attended the conference. Eduard Rossel considered the conference to be a pace-setter for the forthcoming Summit of the Heads of the SCO member states that will be held in June in Yekaterinburg and wished the young delegates a constructive dialogue, pleasant acquaintances and good friends for years. The preservation of the national and religious traditions among youth will be one of the major priorities of the new organization. 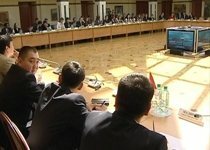 The same problem was previously discussed during a round-table meeting “Experience and methods of teaching national languages of the SCO member states”, held on 3 May.